Oh Lululemon. You just don’t get it. A Dallas Lululemon store chose this display to use after turning down a charity request from The Family Place for battered women, who use ‘Partner Cards’ as a way to fundraise for their charity and is well established and known in their community with over 700 participating retailers. 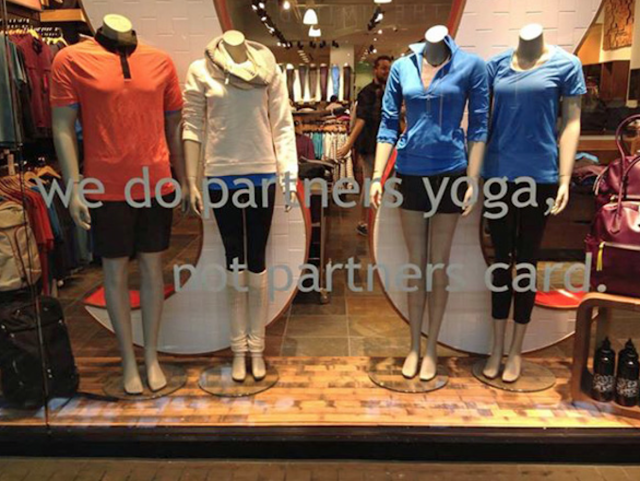 Not only did Lululemon decline to support the charity (entirely their prerogative) but they then chose to exploit the charities message in order to market their own product with this window display. After several customers voiced their disgust on the lululemon Facebook page, the Dallas Lululemon store removed the window display. This display is offensive on multiple levels. First of all, exploiting the ‘partner card’ campaign for their own marketing usage and secondly, referencing ‘partner yoga’ in the context of domestic abuse situations. Lululemon later back pedalled in a Facebook statement saying they were ‘jamming’ with the people at Family Place in order to come up with another way to help, and offered yoga to the abused women and children. Yoga! Something they already offer every customer for free as part of their ambassador program where they use ambassadors to teach their classes. Yoga to women who are leaving their lives behind and worrying about how they will meet their children’s basic needs of food, water, clothing and shelter.